FastTicket is One Stop Solution for Movies ,Events, Recharges and Travel Booking. 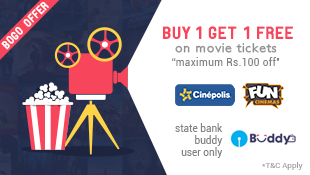 Now Book 2 Movie Tickets Via FastTicket Via SBI Buddy & Get 100 Rs Off! Avail this Offer by following steps. How to book Movie tickets at flat Rs 100 off ? • Now log in through the registered email Id and password or get registered through your facebook or gmail account if you are a new user. • On payment gateway , choose SBI BUDDY wallet as a mode of secure payment of your transaction. √Done!! The discount will be applied.